When talking to Dain Blanton, you instantly feel you are talking to an expert. Dain is not only the Olympic gold medalist from Sydney 2000 and first African-American to ever win an AVP Title (1997 AVP Hermosa Beach Grand Slam – at the time the biggest prize purse tournament in beach volleyball history). Since ending his playing career, Dain has been working in sports broadcasting the past decade, covering many sports as a reporter including Major League Baseball, College Football and Basketball as well as a five year run in the NBA as a reporter for the Los Angeles Clippers. He is now an analyst for the AVP and FIVB tours on NBC as well as Women’s Collegiate volleyball on ESPN. Moreover, Dain is an assistant coach at University of Southern California (USC) Women’s Beach Volleyball team which has won the collegiate NCAA Championship the past three seasons and he also gives 20-30 motivational speeches at schools and universities per year. His familiy originally being from New York, Dain is thankful for having grown up in Laguna Beach (California) which enabled him to start with volleyball and beach volleyball from an early age. He preferred beach to indoor volleyball since it requires a well-rounded skill set. 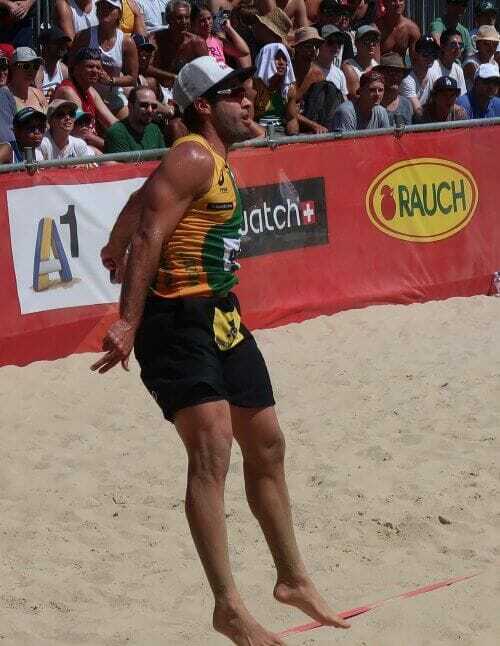 At the same time he is convinced that beach volleyball helps the indoor game and vice versa. “The AVP tour is very strong and has always set the standard. I grew up watching and then learning my playing skills competing on the AVP. The international competition on the 5-star FIVB Major series is very deep, there are so many great teams because you are dealing with the best from all countries. To win on the international level is a huge challenge for any team. When considering the change in beach volleyball since his Olympic win, athletes have gotten significantly taller and physically stronger. Great examples are tall players as Evandro (Brazil) who besides blocking and hitting also have a considerable level of defending skills. The presumably most skilled player in the world might be Phil Dalhausser (height: 6-9/206 cm) who is most often rewarded for being best server, best setter, best blocker and best hitter. Overall, the level of international beach volleyball is higher and more competitive than it used to be. This development is partly due to rule changes that occurred after Sydney 2000 when the court size was reduced from 30x30 feet per side to 8x8 meters. Since this rule change made blocking more effective and favorable for tall full-time blockers, Dain and his Sydney 2000 partner Eric Fonoimoana split up in search of taller partners for the Olympics 2004. When asked for his favorite player, Dain refers to Bruno Oscar Schmidt (Brazil) because of his technical skills, his approach and anticipation. Although playing with his rather intimidating partner Alison, opponents usually do not serve Bruno due to his extraordinary skills. Similarly skilled players are Janis Smedins (Latvia) and Nick Lucena (USA), both rather short and technical players who show the importance of well-rounded technical skills in beach volleyball. On the women’s side, Dain is impressed by the latest success of April Ross and Alix Klineman at the FIVB 4-star event in The Hague (Netherlands). Regarding his current activities as assistant coach and motivational speaker, Dain is passionate to pass on some of the skills he has learned in his professional career. Especially his speeches at high schools are full of inspirational stories on what it takes to be successful which includes work ethic, tools and the art of surrounding yourself with the right people. We will meet Dain again this season as commentator for the FIVB Major Series. If you want to find out more about his current projects, check out Dain Blanton’s website and Facebook page. What an inspiration! My daughter has played competitive volleyball for school and recreation for several years. 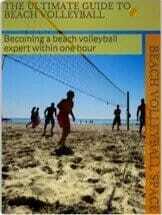 Beach volleyball is a relatively new incorporation into her rec league. She is thinking that she is going to give this a try! I am going to have her read your article when she gets home for a little educational value as well as inspiration! Thanks so much! Great story! This is an inspiring message we can all take into every aspect of our lives! Very impressive! I’m sure Dain had a chance to meet a lot of talented people. Gives you a deeper respect and appreciation for Olympic competitors and the discipline and work that goes into preparing for an event of that size and prestige. I never took into consideration how athletic you really have to be to play beach Volleyball Legit. Like just looking at the images you have in the article these guys are jacked and I bet have tremendous amounts of cardio. Nice article I enjoyed reading it. Totally. Playing beach volleyball requires a wide range of skills and to get in shape you really need to train your entire body…Great you enjoyed the post! Great article and inspirational material throughout. I love beach volleyball, what a great workout! Thanks for the information and inspiration. The events calendar is awesome as well! Thanks for your great feedback. I am happy you enjoyed the reading! Thank you for such an enlightening interview. I always think it’s so important that on the road to success, you must take on board lessons from the top people. Definitely. I agree that it always makes sense to have a look on how the top people approach things. Great inspirational story Juan. I love beach volley ball as well and when Karri Walsh Jennings and April Ross were in the Quarter finals against the Aussies, I was hooked. I do not like that Karri retired but April is a shoe in for a medal in the next Olympics in my opinion. Great post, I loved it and thank you for sharing. Thanks, Bobbi. Great you like the post! Actually, Kerri didn’t retire. Like April, she will also go for Tokyo 2020, it is just that they are playing with new partners. Dain is a great example of an athlete giving back to the sport. So many athletes just take and then leave, but Dain has made volleyball a better sport both during his career and after. Kudos! Definitely. He is a great ambassador for the sport!